Want to learn more about Ocean Pollution? Grades 5-12, also appropriate for adults. For a 51 minute Presentation, Clean Ocean Action generally asks for a $100.00 donation to help ease the cost of staff. The water off the NJ/NY coast is called a bight. Learn what makes this area so special and important. Program includes an overview of this little sea in the big ocean, its legacy of pollution, and a solution to protect it. All grade levels, also appropriate for adults. For a 50 minute Presentation, Clean Ocean Action generally asks for a $100.00 donation to help ease the cost of staff. Clean Ocean Action offers informative environmental education presentations to teach students about the issues surrounding ocean pollution. The "Pointless People Pollution" Presentation includes information about the function of a healthy watershed, storm water runoff, plastic pollution, the effects of non-point source pollution on the ocean, and a Coastal EnviroScape demonstration as well as ways to become the solution to ocean pollution. In addition, Clean Ocean Action provides many other educational presentations about current and past campaigns and initiatives. All presentations are tailored to the age and size of the audience. The discussion is presented in a Power-Point presentation. For more information or to schedule a presentation, please contact Citizens@(Spam protected email address)CleanOceanAction.org or (732)872-0111. 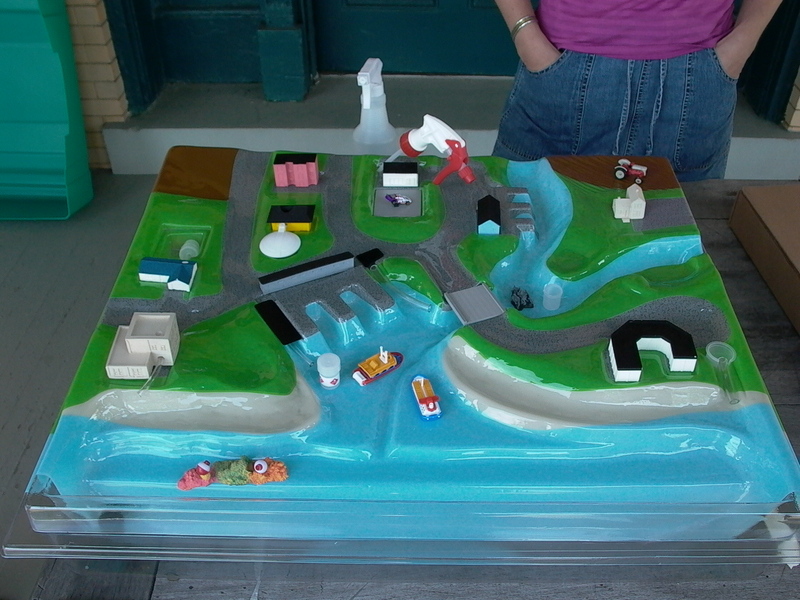 The Coastal EnviroScape physical watershed model, and an on-site program at Sandy Hook.